Welcome to our Happy Halloween Link Party! We are a group of creative bloggers here to share with you our love of Halloween and to showcase your awesome Halloween projects and ideas by joining in and linking up! It's that time of year when you get to make silly and frightfully funny and spooky looking things for your Halloween special occasions and events! For me, no Halloween celebration is complete without a witch! 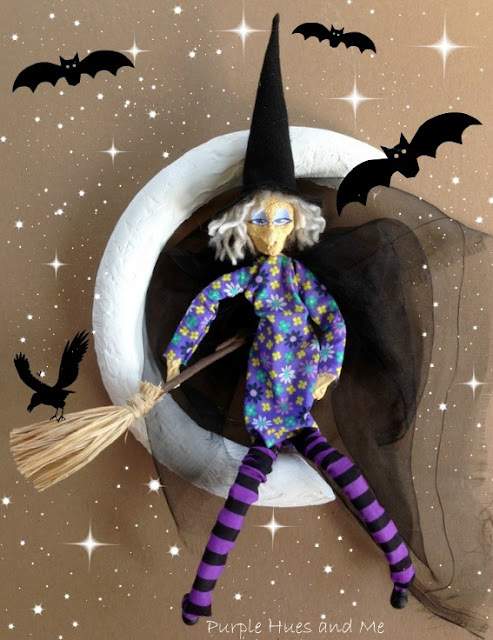 And they're so much fun to make like this recycle witch I created here! But the best part is how easy it is to make one! For this witch, would you believe I started with wire? Yes wire, from the dollar store, and then added a few scraps and materials I had around the house. And the fun part . . . she's sitting with her broom on a styrofoam crescent moon! What a cute Halloween accent piece! Begin by cutting and folding together the wire to your desired witch's height. Then, twisting the wire for the head, body and legs. Add arms by wrapping more wire around body just below head area. Slip a small styrofoam ball over the head area. Slice a toilet paper tube open, add glue on one end and fold over wire body. Continue wrapping tp tube around wire body, adding glue as you wrap. Wrap the arms and legs in same manner, cutting and adding smaller tubes to fit legs. Wrap tp tubes and exposed wire with masking tape for additional volume. To make witch's narrow face, shave excess foam off of ball using a craft knife while squeezing foam tightly on sides. Add a nose made of hot glue - by dropping hot glue on parchment paper, cool slightly and shape. Indent eye area with finger tips and paint head. Cut yarn, wrap around fingers and tie together. Pick out the fibers and glue on for hair. Make hat out of felt by rolling a cone shape (ball head) size and gluing together. Use cone base to measure opening for drawing brim, and cut out. Glue together. Make stockings out of scrap material by cutting a couple of small long strips of material and gluing edges right sides together and turning inside out. Make dress by cutting out a large rectangle, right sides together, baste sleeves and body, turn inside out. Cut opening in back, gluing down edges once on. Glue on eyes from witches eyes template (google). Paint on mouth. Add cape from black scrap material. I removed rubber shoes from an old doll and glued them on, but you can also use a witch's shoes template and cut out of felt, glue together, and stuff with fiber-fil for shoes. For the Crescent Moon, 1. Place a styrofoam ring in Proxxon Hot Wire Cutter and remove a portion for a "C" shape. 2. Cut ends at an angle. 3. Fill in foam crevices with spackle and . . . 4. Let dry. And of course, the witch is not complete without a broom. Just gather together a bit of raffia around a small twig . . . tying it off with a piece of the raffia! And don't forget to give the raffia ends a smooth straight finish using scissors, for the perfect witch's broom! Be sure to visit all of us on our blogs to check out more awesome Halloween projects and to link up your favorite and frightfully fun and spooky Halloween creations! Have fun visiting and linking up new or old DIY Halloween projects, crafts, recipes, costumes or party décor - anything Halloween! How creative you are Gail, talk about making something out of nothing, wow! She is adorable and I love her moon! Thanks for the party fun, I'll be sharing on twitter and pinterest! Super cute Gail. The crescent shaped moon reminds me of the Grandin Road one. The molding of the witch and her face is fantastic. Gail I love how you can create out of nothing. I take things and repurpose them but you are a magician. Love this witch of yours and the look on her face is priceless. Que buen trabajo y me encanta ver todo el proceso de creación. I am so impressed that you made this witch from wire!!! She's cute! I love her purple and black tights! Pinning!! Gail, your creativity is endless! This witch is great! Using wire was such a clever idea. What a fun Halloween witch! So cute Gail! Love this adorable little witch! Love your cute witch! Thanks for hosting the party too! So much fun! Adorable witch! Hi Gail, I'm Stephanie and I really enjoyed your "about" page, as I have so many similar interests. I am also a writer and wrote a ghooooooost story that I hope you'll check out at www.thewritesteph.com! Tomorrow I plan to post about furniture that I've painted and hope to sell. So nice to meet you! That is so creative Gail. I love this idea! Wow, it's amazing how you made the witch from wire, tp rolls, styrofoam and some fabric. Love how you changed the round wreath to a moon too.